It's a gorgeous comforter set. I love the texture and color. I would highly recommend it. It's a good value. Enjoy the sumptuous feel and shabby chic style of this eight-piece comforter. Filled with plush polyester, this embroidered comforter set includes euro shams, decorative pillows, and a tailored bedskirt. I love this comforter set. Lightweight and the quality is very nice. I have a footboard and sideboards on my bed and I did not use the bedskirt that comes with the set. The comforter falls in the middle of the sideboards on both sides just as I wanted. I use 3 euro pillows on my king size bed and the comforter set only comes with 2 euro shams. I had to purchase a different euro sham for the third pillow and used the different sham in the middle. It really doesn't look bad at all as I was able to match the color perfectly. Just wish you could have purchased a third euro sham separately. I received this comforter with a 1/2 inch whole on the upper top portion. Very disappointed because I saw all the great reviews. I will not reorder. Only Good thing is Overstock is great at returns. This bedding is perfect for someone looking for a rustic, yet modern look! It fits perfectly with my decor. 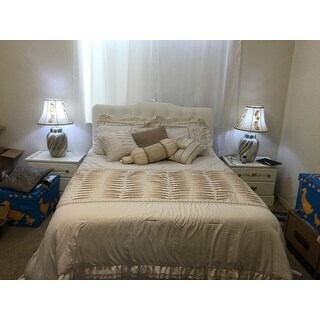 Very high quality and beautiful comforter set. Comforter is adorable and I love the way it looks. Paired it with deep red and navy accents and looks so good! The fill in the comfortable is very thin so don't plan on using it for warmth. I like it, yet it’s not as “expensive” looking that I was hoping, its very pretty though. I wasn’t aware that the euro pillow cases needed large square pillows to fill them, I had to use my regular “American” pillows and fold down the extra fabric when putting them on the bed. i didn’t know what “euro” meant. Now I do. The comforter is warm which is good, I haven’t had it long enough to wash yet, so not sure how it will hold out in the washer. I didn’t really like the quilted flaps, but again it’s pretty and very romantic ( gone with the wind) kinda feel. It fit nicely on my Queen mattress as well as the skirt. I absolutely love the look of this comforter set. It pieced nicely with the way I have my room set up and goes perfect with the theme. The off white cream color that it is makes it easy to switch up the color theme if you were to change it. The throw pillows are small and quite simple. I ended up purchasing different throw pillows to complete the look I was aiming for. The comforter and shams are comfortable to sleep on. What I didn’t like about it is that the thread design in the comforter and shams are starting to come apart and I’ve only had the set for a few months. Also I would recommend using an under blanket to keep warm in colder temperatures because the blanket alone doesn’t keep me warm enough at night. For the bargain deal that I got the set for is well worth it! This was even more than I expected and I’m picky. I had looked at multiple $350 sets at bed bath and beyond and this quality is a well match. I also loved that the comforter fit my king bed mattress. All the comforters before weren’t wide enough. I have searched for the perfect comforter that is classic and feminine. The fabric is lightweight, and soft and it lays perfectly. It has regular decorative pillow cases plus euro shams, so I did have to go out and buy the euro pillows. I’m not sure if the small pleats are all supposed to go in one direction, but they don’t. Still looks good. The negative part is how wrinkled it is out of the package. Fortunately, my hand held steamer worked them out very easily. I would buy this again. I’m using this set on a guest bed. 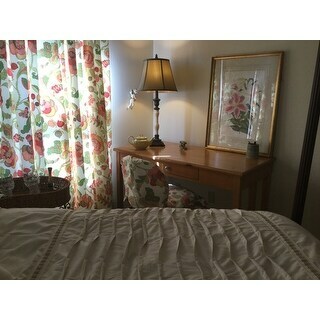 It’s a pretty set but the fabric is thin and the pleats on the comforter aren’t secured very well, so they lift up. I liked it a lot at first, but after I had to wash it it came out all messed up. The filling inside the cover is all bunched up now and doesn’t lay flat and nice like it did. Very disappointing. Quality is not what I had hoped for. Material is thin and the stitching is definitely done in China. It would be a good "Walmart" comforter. Love the color! Material of comforter is thin, but soft. I find it difficult to make it look straight on the bed due to the pleats on the top. Arrived early, &amp; is beautiful in my bedroom. I'm not sure how well it will hold up, it's not terrible quality, but it isn't great either. That being said, it was worth the price &amp; does look lovely. Love it! So feminine. Warm but light weight. I searched a long time for a new bedding that I really liked. I don’t replace bedding often and I’m very picky about the product. This sett attracted me for several reasons. It was attractive; it was the right color; it was the right price. I ordered it and it was delivered promptly. I love it and I know it was the right purchase at the right price. Its a nice color but the material is scratchy. I have to use another blanket under it because the material can be irritating next to your skin. I would not recommend it for that reason. This set is pretty and good. It's a tiny bit cheap but not bad. You get a lot of pieces for not a lot of money. So you get what you pay for. I bought this because my granddaughter had purchased it and when I saw it on her bed, I fell in love with it. It is absolutely beautiful. Looks exactly as the picture posted It is stitched well, patterns match. I love it. It is a dusty rose, very feminine! The pillows are nice, cuddly cute. With the skirt, shams and pillows that match, it is a terrific set. 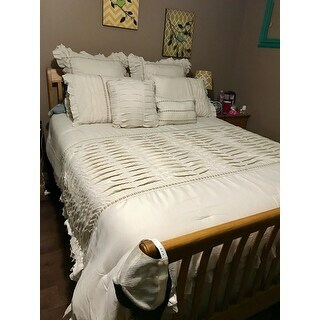 This bedding set is perfect, good material, fit my bed nicely. It’s beyond my expectations. I would recommend this product to anyone. This is just perfect! Love it. This bedding set is a tremendous value for the cost. Looks very rich and has a great feel. Used in a room with all neutrals and it works beautifully. Would purchase again. I love this comforter, I love the color, it’s light but warm, and it looks lovely on my bed! "What are the 8 pieces that are included?" 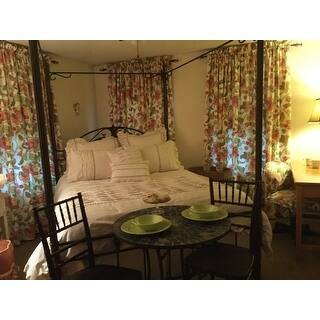 This includes, One comforter, 2 Shams, 2 Euro shams, Bedskirt, Square decorative pillow, Boudoir decorative pillow. "can you please contact me if you get a blue or aqua full/gueen back in stock? I may find another one but this is very pretty. thank you." Unfortunately, the blue is discontinued. "What are the dimensions of the California King?" "Is this a cover? Is there a zipper along the seam that I can stuff a duvet into? " No, this is a comforter. I hope it helps. "Is there anyway I can just buy two more Euro pillow shams? I bought the king size one and I feel like I need two more because my bed is so wide. " Unfortunately no, additional Euro shams are not available. "Does the mauve come in a twin?" Unfortunately no,the twin size is not available. "What size is the king size comforter measure"